Choosing PBI (plant based infills) means using an expensive and controversial product that requires the use of carcinogens and many chemicals, in addition to being a respiratory risk. It means a headlong rush into other dangers with multiple and unknown angles. Corkonut turns to dust, and it also blows away and floats readily during storm events, fouling waterways with suspended solids (TSS) and nutrients, plus any binders/adhesives and biocides/antifungals, etc., used on the field, and increasing maintenance costs. 7,000 lbs of infill migrate out of GreenPlay artificial turf fields and into the environment every year. This also puts athletes at higher risk for concussions unless the field is groomed, and/or more infill is added. It costs $4,200/year/field just to replace lost infill. Health QUESTION: GreenPlay and PureFill fields are 40% corkonut and 60% silica sand. From synturf.org: "There is about 129.6 tons of tire crumb infill and 120 tons of silica sand on an artificial turf field – that translates to 52% tire crumb and 48% silica sand. 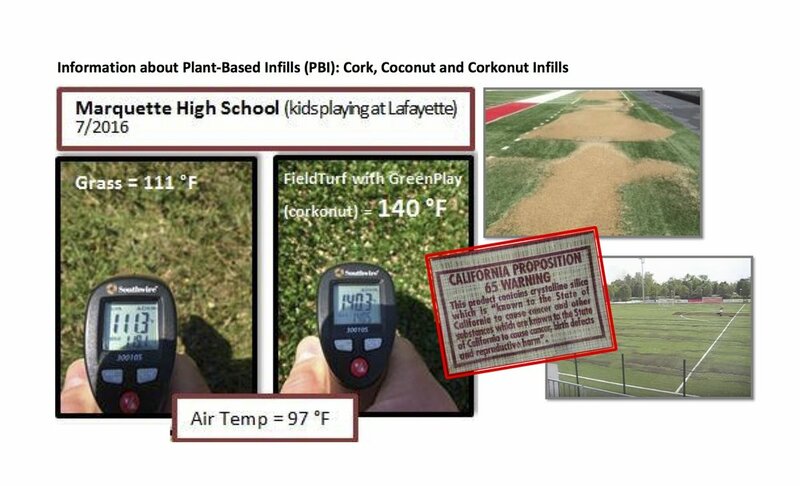 Given the relative weight differential and compaction characteristics crumb rubber and plant-derived (“corkonut”) infill it makes sense that a plant-derived artificial turf filed contain more silica sand than a crumb rubber infilled field. For example, in both GreenPlay and PureFill fields there is 80 tons of corkonut and 120 tons of silica (that is 40% corkonut and 60% silica sand)." 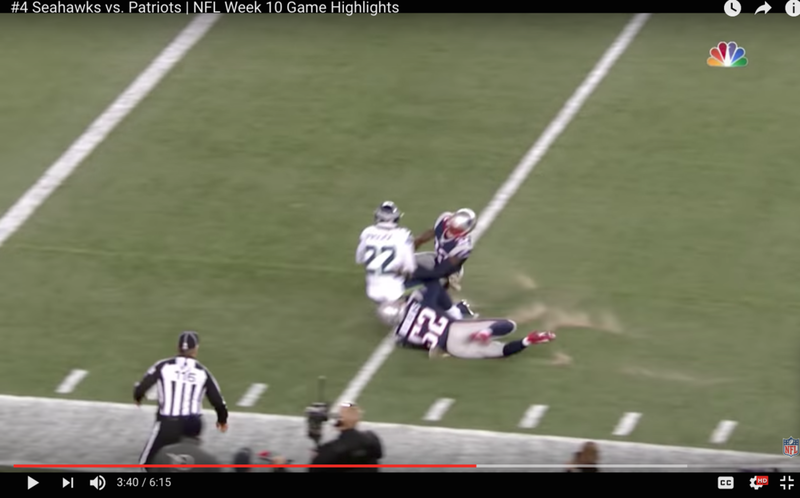 Below are screenshots of NFL players diving into silica sand at Gillette Stadium. (Click to enlarge.) Gillette Stadium uses a silica sand + waste tire infill mixture. A variety of chemicals are sprayed at factory and regularly after installation during field life cycle due to: insects, weeds, fungus, blood, vomit, animal feces, gum, oil, grease. Deceptive marketing material confuses consumers. Communities are told they have an option to purchase "organic corkonut infill." However, this infill is not certified by the USDA or any third party as organic, and is totally unregulated. PBI comes with its own risks, and has known issues similar to tire-infill (high temperatures, inhalation risks, lack of regulation, undisclosed chemical additives, etc.). The source of the infill is undisclosed and its chemical treatment in prior use is undisclosed. Numerous unknown issues that have not been reliably measured, pro or con, by reliable, third party researchers or analysts. No long-term study on the effects of children inhaling chemical-laced PBI has ever been conducted by anyone. Poses this critical question: are we willing to take the risk posed by this non-uniform, variable toxic mix, over time, in high heat, on our children?